Hey, Aren't You the Janitor? And Other Tales from the Life of a Children's Book Author is a collection of stories about my life on the road as an author of children's books. That's what you do when you publish books for young readers: you hit the road and entertain them. Twenty-five years of traveling around the country gave me quite an opportunity to collect stories. 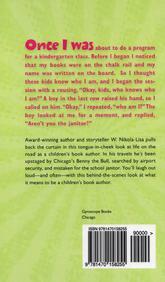 The title, for instance, comes from an interaction I had at a school many years back. I was slated to talk to several kindergarten classes. When I arrived at the room, my name was on the board and my books were lined up on the chalkrail. Naturally, I thought the kids knew who I was, so I started my program with a rousing, "Hey, kids, who am I?" A boy about five rows back shot his hand up, didn't even hesitate. So I called on him: "Okay, who am I?" 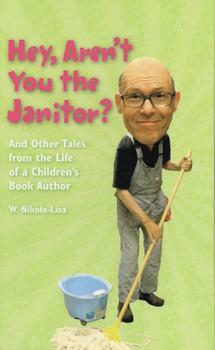 He looked at me, squinted, and asked sheepishly, "Aren't you the janitor?" Well, no, but years later, I realized that it was a great title for a book. Title: Hey Aren't You the Janitor? Looking to purchase a book or two?